to enjoy the best benefits! 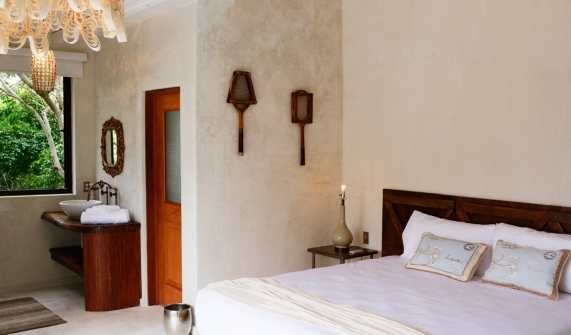 Natural, local materials such as stone, polished concrete, and bricks were used to create the hotel’s simple earthy vibe. 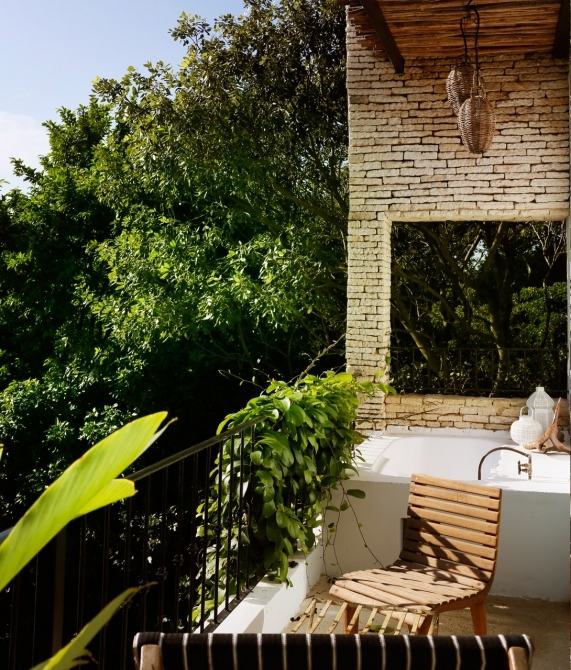 Suites, such as the Terraza, even have outdoor baths for the ultimate laidback lifestyle. 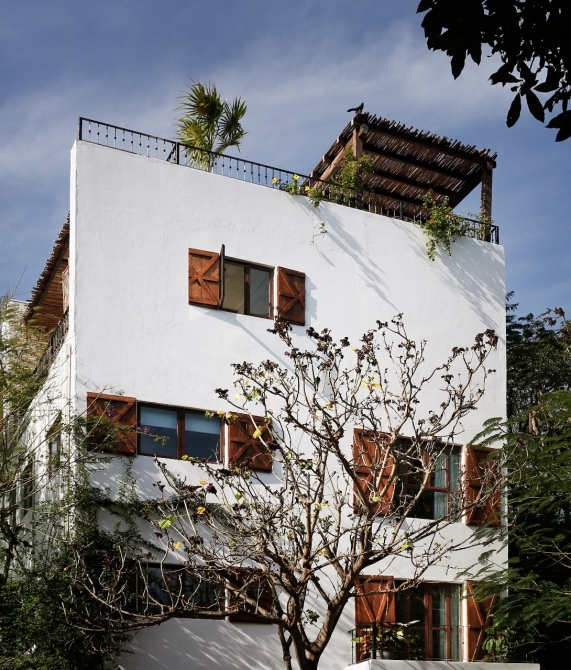 Mirroring the basic white geometric buildings dotting the shoreline of Playa del Carmen, the hotel’s building, which dates back to 1990, has been minimally refurbished in collaboration with architect Jaime Ingelmo to retain its local authenticity. That said, the wooden shutters on the windows are a nod to Schärer’s stint in Switzerland. Owners Alexis Schärer and Angie Rodriguez were inspired by the different parts of the world they have called home. 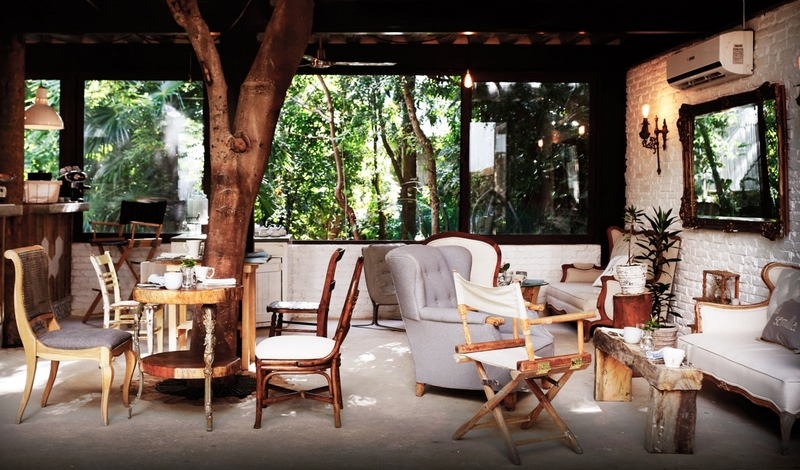 They've worked closely with antique furniture restorer Andres Ocejo to realize their dreams. 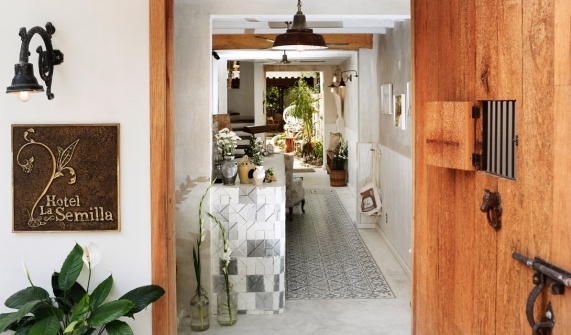 The result is an elegant mix of furniture and references—the concrete floor harkens back to Greece; antique handmade mosaic tiles recall those of the Yucatan region; and an industrial loft atmosphere is akin to what one might find in New York. White pervades all spaces with its quality of timelessness and calmness, and the sense of expansive space. In the Suite Terraza, gilded frames and chandeliers are an ode to the elegance of Saint Barts. Please double check your email address and confirm. You may opt out of email communications about services from Design Hotels TM via your account settings at any time. Already a member? Log in here Or did you forget your password? your email address. Please check your inbox. Your profile changes have been successfully saved. Are you sure that you want to delete your account? You will lose all of your saved information. it may take up to 24 hours to take effect. Contact us any time should you require assistance in the future. You already have an account with Design Hotels™ and are receiving our Newsletters. Click here to alter your newsletter settings. Thank you for registering and welcome to the Design Hotels™ Community! Your account is now active. Please don't forget to validate your membership by following the instructions in your welcome e-mail. Join the Design Hotels™ Community! Get access to 50% off at new hotels. Be the first to learn about great deals and destinations. Be invited to exclusive events. And much more! Already a Community member? Log in to access special rates and exclusive offers. Are you a Travel Agent? Sign up to access special rates and higher commissions. You may opt out of email communications from Design Hotels™ at any time. Please don't forget to validate your membership by following the instructions in your welcome email. Thanks for getting in touch. Our experts will take care of your request shortly.